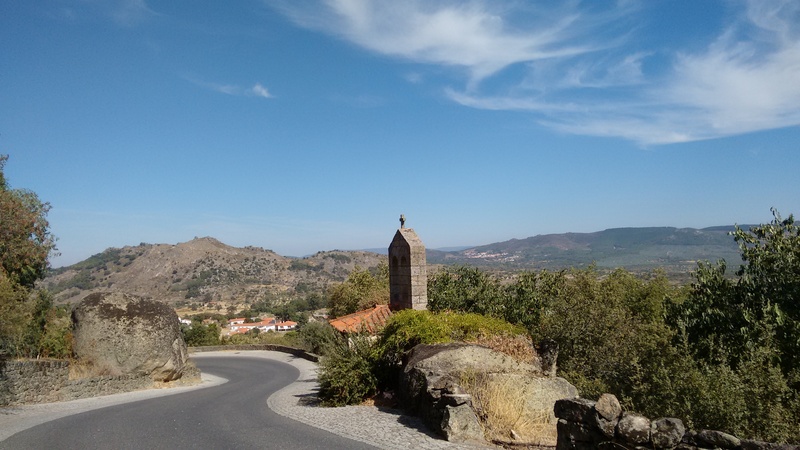 This section is for information on planes, trains and ferries – options on getting your bike to Portugal and transporting it around once you’re here. Different airlines have different rules regarding carrying bikes and – as airlines and their policies change over time – it will be safest if you check with the individual carrier. British Airways will let you take a bike for free as an item of luggage, as long as it is no more than 190cm in length, packed in a protective bag/box and you notify the airline at least 72 hours in advance. For full details of conditions relating to bike transport, click here. easyJet – who fly several UK to Portugal routes – will take bikes if in boxes or bags. For further details see here. RyanAir charges €60 euros to carry bikes if booked online in advance. For their terms & conditions, click here. As of 2018, Portugal’s national carrier TAP carries bikes (including tandems) as long as they are less than 32kg / 70lbs. Charges range from €50 to €150. For more information see this page on the TAP website. It might also be worth looking at this page from Britain’s national cycling charity, the CTC – who sell a polythene bike bag for the grand sum of £6.50. One possible advantage of using a clear plastic bag rather than a box is that baggage handlers can see what it is and – hopefully! – won’t pile other heavy items on top of it. The Portuguese rail network – run by Comboios de Portugal (CP) – includes fast intercity services, some much slower regional trains and urban services around Lisbon, Porto and Coimbra. However, ordinary (non-folding) bikes are not allowed on all services/lines so check before booking any tickets or assuming you can use the trains. The number of spaces for bikes on each train is also limited. In general, bikes are allowed on urban and most regional services, plus some long distance services and always go free. Full details (in English) can be found on CP’s Bike Transport page. Intercity – UPDATE – As of March 2018, 2nd class carriages on ALL intercity trains have spaces to take two bikes – rules permit one bike per passenger (max 15kg). Regional/inter-regional/Coimbra urban services: bikes are allowed if there is space. However “temporary restrictions” introduced in September 2016 severely limit the transport of bikes on some lines. Restrictions may depend on the time of day, the day of the week and the particular train. See the CP website for full details. Previous restriction on the Minho and Douro lines appear to have been lifted. Sleeper trains: up to two per compartment if the whole compartment is booked. Celta line (Porto to Vigo in Spain): up to three per train or “bikes can be carried so long as they are disassembled and properly packed so they can be taken as hand luggage, only one per passenger and the do not measure more than 1.20x90x40cm”. Shows as IN on timetables. CP has a good website for buying tickets or checking times. For English, click on the UK flag icon. To work out which towns are connected by which services, the best thing is to visit CP’s How To Travel page. The company’s useful information page may also be… useful. Intercity: The good news is that these are pretty cheap. For example, the 3-hour intercity service from Lisbon to Porto costs between 24 & 30 Euros in 2nd class. As mentioned above, the good news is that Comboios de Portugal (CP) now allow up to two bikes in all second class carriages. Regional: Passengers are allowed one bike each – although CP say you are responsible for not blocking access and should ask the ticket inspector if there is room before boarding. Trains on the Algarve line have a dedicated compartment with special hooks for holding bikes. The other advantage of regional trains is that they’re often 25-50% cheaper. Be aware though that while some lines have plenty of regional services, other are much more limited. Departure times are also not always that convenient. There are only two regional trains from Porto to Lisbon – leaving at either 20.00 or 01.30! Urban: These services may be useful if you don’t fancy riding into either of these cities. Same rules for bikes apply as with regional trains. 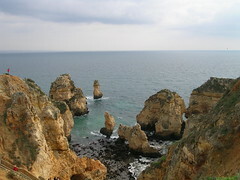 The Porto network connects with Braga, Guimaraes and Aveiro, while Lisbon’s network can get you out to Cascais, Sintra or Setubal. Portugal has a number of bus/coach companies carrying passengers between most towns – and across the border into Spain. Fares are normally quite reasonable and buses often a better bet than trains for frequency of service, faster journeys and more convenient departure times. However, different companies will have their own rule on carrying bikes. Rede Expressos is the biggest bus company and operates across the country. According to their website, they only take folding bicycles and passengers are allowed luggage up to 20kg in weight, which “does not include sports equipment, guitar cases or any other unusual shaped items”. However, they will take bikes! Fellow cyclist Raj Kumar flew to Lisbon with easyJet in March 2014 and took his bike in its 25kg EVA box on the bus to Évora – and wasn’t even charged anything extra. EVA Transportes (not to be confused with the bike box makers) operates in the southern half of Portugal with connecting services to Seville. In an email to one customer inquiry, they said that they do carry bikes if properly packaged. If I find details of any other companies that carry bicycles, I will update the package. Alternatively, if any other riders can help expand this section then please share your knowledge! The airports at Porto and Lisbon are both connected to metro systems. If you’re flying in and need to get into town, this is probably the cheapest and simplest option – although note that bikes have to be put into the rear door on the metro. Both metro systems are quite new, efficient and cheap. The only issue may be that not all stations have escalators so you may end up having to carry your bike/box. Algarve: The only place you’re likely to find a ferry into Portugal is right down in the south where you can cross the Rio Guadiana from Ayamonte in Spain to Vila Real de Santo Antonio. It’s a passenger ferry but also takes bikes. Lisbon: Ferries can be a very useful way of getting in and out of Lisbon. I’m not sure it’s possible to cycle either the Ponte 25 de Abril or the huge Ponte Vasco de Gama but neither would be a pleasant experience even if allowed. As of March 2014, bicycles are allowed – free – on all ferries operated by TransTejo and Sofulsa. The company’s website lists various conditions but it basically boils down to there being space and the bicycles not causing an obstruction – and you’re not allowed to leave grease or debris on the decks! If you can’t get bike in back of a car, there will probably be some minibus taxis around. Might cost a few Euros more but it’s only a short journey. I’m flying to Faro with my bike at the end of this month to bikepack the Trans Algarviana with my brother who lives in Portimao. I understand from your site that we can travel on the train from Lagos to Vila Real but can you advise the best way to get to and from the start and finish at Alcoutim and Sagres? Are there any taxi companies that you can recommend that would pick us up from the train station with our bikes and gear? Hi Tom. I’m not aware of any taxi companies that are specifically set up to carry bikers but I’m sure you’ll have no problem persuading someone to take you for a price. I’m not sure about the Alcoutim end but EVA Transportes have buses from Lagos to Sagres. Don’t think they generally carry bikes but if you ask the driver there’s a fair chance they will let you on – but you’d need the bike well packed if it’s going underneath with all the other luggage. Otherwise… it’s a pleasant day’s ride both ends! Thanks for the info Huw, I think we may well bike it and make a good week of it! Thanks for your great website. Can you tell me if there’s a ferry on the N359 road between Barca da Amieira-Envendos and Amieira do Tejo? It shows up on Google Maps, but I can’t find any information online about it. To see what I mean, look at http://tinyurl.com/isthisaferry . We’re planning to take the train from Lisbon and then picking up your Border Castles route headed south. If this ferry isn’t there, we’ll continue on the train to Vila Velha de Rodão. Hi Mitch – Glad the website is useful. I’ve never tried the crossing you mention but I think it is EXTREMELY unlikely there is a ferry there. I think this is just an old road on what would now be a very minor route. If I was you I would catch the train to Belver and cross the river there. Nice little castle in Belver although quite a climb up to Gaviao on the other side. If you can, I would avoid Vila Velha as the N18 road south from here is not pleasant cycling. Narrow hilly and with lots of trucks. It is rideable but the first 6km are quite hairy. If you do go this way, take the first opportunity to turn off (right ) on M527 – this will take you on a big loop but it will be much more pleasant than the N18. We will be arriving in Lisbon with a rental car and 2 bicycles. We are returning the rental car at the Lisbon airport and are looking for a place to store the bicycles while we visit Lisbon for a few days. I see that it’s possible to store the bikes at the Lisbon airport, but they require bike boxes. Any idea where we can get a bike box if we’re already at the airport? I also thought about storing the bikes at our lodging, but I was hoping to avoid carrying luggage and the bikes on the metro and on the streets to the lodging. We eventually need a bike box to fly out of Lisbon at the end of our trip, but it would have been so simple and easy if we could store it right at the airport. I don’t honestly know but you could try contacting one of the local bike shops – can you go via there with your car? There are also some shops that offer a packing service but have never used them myself so cannot recommend them personally. Any bike shop that sells new bikes has empty bike boxes they usually give away. Or they can help pack the bike for a fee. But how to get the bike and box together at the Aeroporto, I don’t know. Were you able to store your bikes at the airport? Sorry, we did not try it. We ended up getting lodging that allowed bike storage. 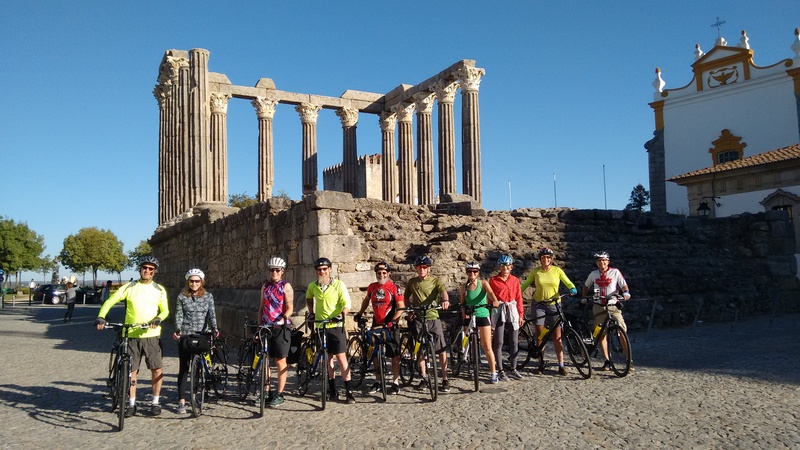 Hi Huw-there seems some good advice on these pages, but could you just clarify for me following-im cycling with some friends from Valencia-Madrid-Porto and because of time constraints getting the train from Porto to Lisbon whereupon 2 of the group are flying back from Lisbon. Myself and another mate are going to/ wanting to take the train from Lisbon to the Algarve to meet families. My mate says that it looks impossible to take bikes (wont be in a box) on that particular train unless folded-would that be your experience too. Hi Simon. As far as I know your friend is right – the only trains to the Algarve are intercity services, which don’t allow standard bikes. (Although I’ve heard of people who have just tried their luck and got on – probably depends on how busy the train is and whether you get a conductor who is a stickler for the rules). I see a problem… our flight land at 19:35 and we should not be able to be at the train/bus station before 21:00. At this time I don’t see buses or train anymore ? Hi. Sorry but I don’t have any more information than is on the bus or train timetables. You might have to spend a night in Lisbon and then travel the next day. Only other option is to hire a car/van but that’s much more expensive. Hi, I come for a week road biking in Portugal end february with my daughter. We fly from Brussels to Lisbon and will arrive around 8 pm. Our accomodation is close to Nazaré but we’ll not hiring a car. What are the possibilities ? bus ? train ? We’ll have our two bikes packed in bike boxes… Thank you ! Hi. There’s a slow train line up the coast. You can get urban/regional line trains – which should carry bikes boxed or unboxed – from Lisboa Oriente (short metro ride from airport) up to a station near Nazare. Main bus company is Rede Expressos, they will probably take bikes boxed but not unboxed. I’m heading to Portugal for three weeks in the fall for a bike trip but will be renting from Lisbon so I will not have a bike bag. What is your experience biking out of Lisbon towards Evora instead of trying to get the bike on public transportation? Depends who you are renting from but it might be worth asking if they can deliver the bike to a hotel in Evora. 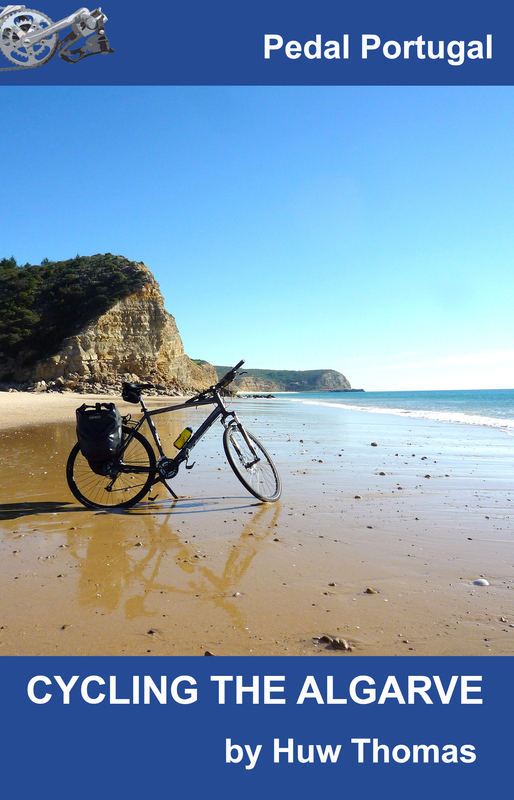 It is possible to ride from Lisbon but the scenery isn’t great to begin with – gets better and quieter as you head east. If you want to ride (or have no choice), the simplest solution is to catch a ferry from the Cais do Sodre quay on the waterfront in central Lisbon. That will take you to Barreiro. This is all very built up (and not very pretty). However, you can take a train from here to Pinhal Novo – it’s only a few stops but will get you most of the way out of the city sprawl and you should be able to take a bike with no problem. From here it’s a straight ride east towards Montemor-o-Novo and Evora. First bit’s pretty boring but it does get better. I ended up renting a bike from Lisbon. The rental company took care of transporting the bike back from Algarve. You have three weeks, so you might consider a detour – first to Cabo Espichel and Arrábida, maybe even Comporta. 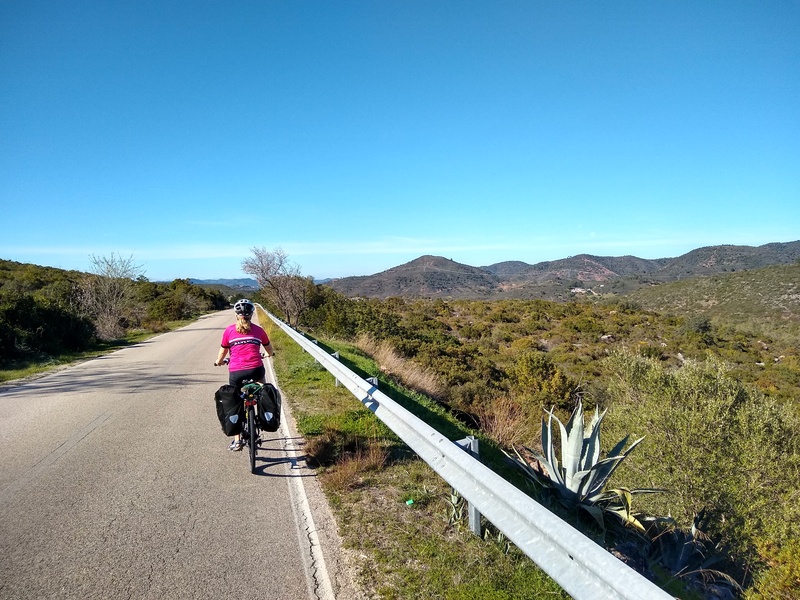 The mountains in Arrábida had one of the best sceneries along my route, but also very steep uphill, so it was very strenuous with a trekking bike and all the camping gear! Good advice – thanks Seppo. I’ve only ridden through the Arrabida hills once (going west from Setubal) and they are definitely tough but also really beautiful. It’s only a fairly small section but I think this is one of the best bits of coast anywhere in Portugal. It would be good to know for sure! I might be able to provide more detail if our Minho tour goes ahead in October. The RENFE website is notorious and difficult to use! We were able to put our bikes on trains along sections of the Camino via de la Plata (Santiago/Salamanca/Caceres/Merida/Seville) without any problems. I would think those trains would be classed as inter-city. Hi Phil. Never tried the trains in Spain myself. I would guess though that its like Portugal, the rules are only there as a guide! Individual train managers/guards may chose to totally ignore them. 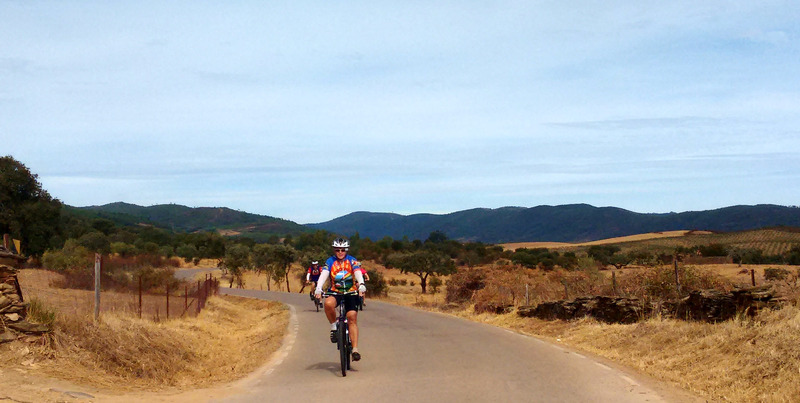 Hi Huw, looking at riding back down the Minho from Rabino to Valenca in Oct 2015. Mindful of your comments re bikes and trains (CP) was wondering whether across the other side of the Minho in Spain RENFE will have a more helpful policy on carrying bikes??? Funnily enough I was looking at the Renfe site the other day. Seems like they have a similar approach – folders only on intercity/fast trains but some bikes on slower trains. Here is my experience in taking your bike in Portugal. I toured in last week of March. I flew with my bike bag from Luton to Lisbon by Easy Jet. I took the bike in a EVA hard case. It was absolutely fine, Bike was not damaged. From Lisbon airport, the easiest way to take the bike box is use Metro. It has wide double doors, get in to the last carriage and keep the box at the end. No problem what so ever. But remember some Metro stations does not have elevators, so you end up carrying the bag on steps. I used Rede Expressos bus service to travel from Lisbon to Evora. The information says that you may have to pay extra. The driver said I have to but his manager told him to just get it in and even helped me to load it in to the luggage compartment. On the way back from Evora, again I had no problem. The real problem is wheeling it on the pavement on the way to the hotel or change from Metro to Bus etc as the pavements are cobbled. It is not so easy to wheel a 25Kg bag on 2 small wheels on a cobbled street. I ended up carrying it in my shoulder/head.